If you wish to install a design that beautifies your surroundings along with assisting the structure of the buildings, then, choosing a styling yet a strong arch design can be your excellent pick. Being an integral part of any building, structure, an arch design is usually suitable for bedrooms, balconies and many other parts of the structure. Nowadays, arch designs are quite popular and coming with intricate patterns to beautify the interiors and its surroundings. With its exclusive design, style and appeal, an arch window designs is making its way to rooms, living rooms and more. Having its exclusive class and looks, an arch design is here to stay for long. 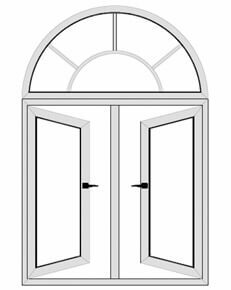 So, if you prefer a royal touch to your living abode, try installing an arch design right now! Arches have been in vogue for long for their strength, support features and looks. They are available in different designs including flat, corbelled, triangular, semicircular, bell arch, bulls eye arch, segmented arch, Islamic arch and much more. Suitable for different space and designing requirements, an arch design is one of the popular designs for your interiors. Window Magic is a popular name in the uPVC doors and windows. The company offers a range of choices in an arch design for customers with varied interests and preferences. Take a tour to our website to check our product portfolio. We have numerous choices in arch design that will please your interests. Come and get the best designs for your homes today! Copyright @ 2011-2017 Window Magic All Rights Reserved.